Me and my big mouth! Why do I have to make promises on somebody else’s behalf when I should know better! LOL. But a promise is a promise. Even if it took a whole evening, night (do not ask me why or how, uh! ), and next (this) morning of badgering a Missus surprised (pleased by?) at the sudden attention! I know one big guy, namely Bill, who might find himself in the exactly opposite situation. One piece of advice mate, do not give away your little (cooking) secrets all at once and you will find yourself basking in a lot of attention (why am I saying that? No way I will translate that in my Japanese blogs, or our Japanese apartment will become a unilateral point-blank shooting gallery!). In any case, Rowena, you might need the help of the likes of Taste Memory Girl as far as some ingredients are concerned, unless you want to send a SOS all over Foodbuzz! The recipe I managed to extract from the Missus is open to variations. Do not hesitate to do your own research and discover new ways, although I can already hear (and welcome) advice from Foodhoe and others! -Marinade: Japanese sake (cheap cooking variety). If unavailable, a strong dry white wine should do. Grated garlic. (Chinese) oyster sauce. You will have to experiment there as far as the amounts are concerned. Nota bene: The Missus, depending upon her “mood” will add grated ginger, reduce the oyster sauce and add rice vinegar, sesame oil or Thai Sweet Chili Sauce. Plenty of scope again to please everyone! -Rice powder, called “yoshinko” in Japanese. I do not know the Chinese or Korean equivalent. That is where you will need a little help from your friends all over the world! No salt or pepper needed. Oyster sauce contains enough salt as it is. Marinade the chicken cut to pieces with the sake (or wine), grated garlic and oyster sauce (or whatever combination) in a Tupperware (or cellophane paper-covered bowl) in the fridge for at least a night. “Deep-frying” is actually “shallow-frying” as the Missus uses a large teflon coated pan with just 2 or 3 millimeters of oil. Oil temperature should be around 180 degrees Celsius. Roll the chicken pieces (do not wipe them, just shake them to get rid of excess liquid) and roll them in a equal mixture of rice powder and cornstarch. Drop in the pieces and fry until colour start changing. Take them out and put them on sheet of kitchen paper to prevent them from absorbing oil. Let rest for a minute or two or until you have fried everything once. Fry a second time until the chicken pieces have attained a rich brown colour. Put them on a sheet of paper chicken to absorb excess oil. 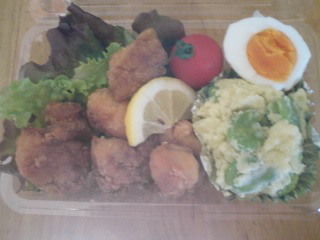 Can be served at once, or later in a bento/lunch box after having let them cool down sufficiently. The Missus will usually serve them with lettuce to wrap chicken in and cut lemon for seasoning. Again, “depending upon her mood”, she will serve in separate dipping dishes tartare sauce, rice vinegar, Thai Sweet Chili Sauce, or a mixture of mayonnaise and Thai Sweet Chili Sauce! Thank you for sharing excellent information. Your website is so cool. I’m impressed by the details that you have on this blog.